Established in 1958, Hidden Lakes Golf Course is an immaculate course that will challenge any level of golfer. Subtle greens, tree- lined fairways, and water coming into play on ten holes, Hidden Lakes offers an array of great holes set in the heartland of Kansas. Hidden Lakes Golf Course is a privately owned, public golf course with competitive rates and world- class golf. As one of Kansas’ premiere public golf courses, your satisfaction is our number one priority. Our ground’s staff is highly trained and always has the course in top condition, at any time of the year. In the past year alone, many renovations have been done to the golf course, by planting 100 new trees. The back 9 has also taken new shape with the addition of four new blue tees, and new walkways. Along with many golf course renovations in the past few years, club house and parking lot upgrades were recentely completed. We have started development on our new golf-learning center and golf club repair shop. An indoor hitting net, loft/lie machine, and all the equipment to do grip and shaft repair are just a few of the changes to our practice facility. Our ground’s staff installed four new greens on the driving range surrounded by bunkers, simulating an on- course experience. Also we have two large putting greens, and one chippinggreen with a practice bunker. We believe you have to practice your best to play your best. Hidden Lakes also offers three banquet facilities to go along with our 4 - star golf course. 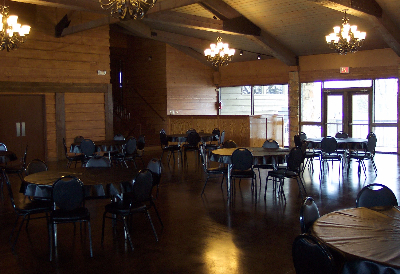 The staff at Hidden Lakes can help make any banquet, wedding reception, or party, a night your guests will never forget. In addition, The Tavern is a full service restaurant with seating for up to 50 people. So host your next banquet here, at Hidden Lakes Golf Course. Hidden Lakes Golf Course has a wide variety of tournament packages, to accomidate small and large tournaments alike. Our banquet rooms can be included on some packages, along with food before and/or after your round. Hidden Lakes is the perfect place to host your next golf tournament, whether it is corporate or private, our experienced staff will help with everything you need to make your event run smoothly.